On 9th May 2017, myself and my colleague went for a evening walk in Besant Nagar, Chennai where we met a “Narikurava family” ( a Nomadic Tribes ) who were busy with their means of livelihood by selling small fancy items like bangles, hair pins, saree pins and combs etc., on the platform. I have known this family for more than five years as animal lovers. The family consists of father, mother and a female child. The female child’s name is Thilothama, 10 years old and studying 5th standard in a nearby school. 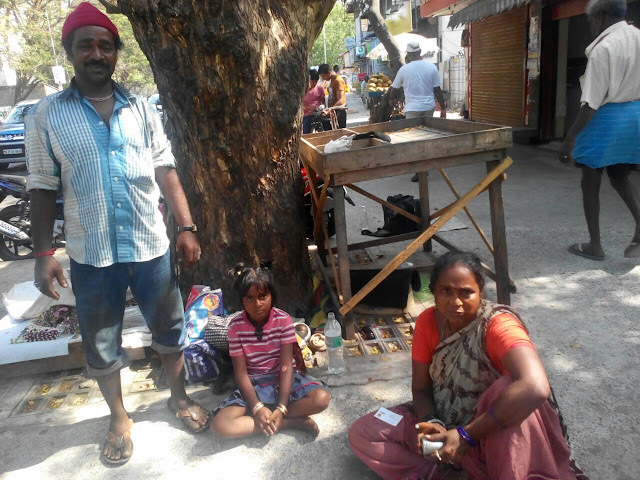 Being a nomadic tribes, the husband and wife are uneducated and homeless, their life and livelihood also on the platform, under a tree. 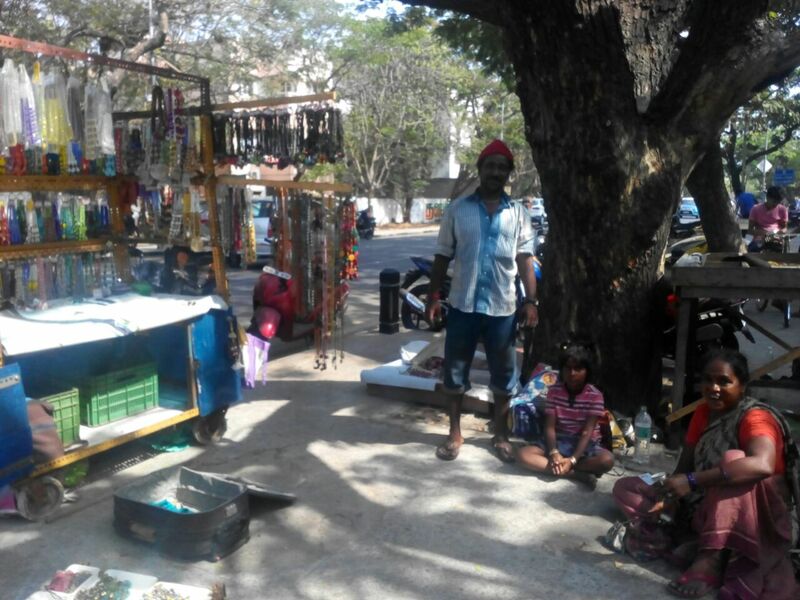 Though they are homeless but fond of animals. They have provided shelter to the homeless animals and made them as part of their family. Like parents, the child is also fond of animals and loving them so much. Being a single female child, she spends much of her time with the homeless animals. There is a strong emotional bond between the child and homeless animals. She used to talk and play with them. When we were walking towards their place the child identified me from her place and running forward to me and hold my hands fondly and started narrating the incident happened a few days ago. While narrating the incident, she took a small old model Nokia hand phone from her bag and showed us the photos of a small new born squirrel. As the family is living under a tree, they used to hear the sounds of crows and squirrels regularly and got familiar to that sounds. One day the sound was little different and unusual, the squirrels made the sound continuously. While hearing the sound, she happened to see a newborn squirrel was falling down near to her. She immediately took the squirrel and kept it safely in her folded fingers with affection. The squirrel’s eyes were not yet opened. Thereafter she started taking care of the squirrel. Every day she fed the squirrel with milk. The squirrel started growing and moving here and there. She happily played with the squirrel every day. After school timings she rushed to her place and started playing with the squirrel. Even while sleeping, she kept the squirrel on her chest. Her young world was rolling and moving with that squirrel only. One day when she was playing with the squirrel in the platform and her parents were doing their work, two persons came to their place and introduced themselves as an animal activist and a personnel of police department. They enquired about the squirrel and asked the family to handover it to them. While enquiring, the animal activist and the personnel of police department were ready to pay some amount of money to the family in order to convince them. But the parents and child begged them that the they were not willing to handover it and wanted to take care of it in their custody. Finally they warned the family to handover the squirrel to the animal activists, otherwise they would book them under Animal Cruelty Act. Also they blamed the family that “You are a hunter, after some time you will kill the squirrel and eat it”. At last, the innocent family with heavy heart handed over it to the animal activist. After handing over it, the child didn’t have her food and crying for three days. The parents too were emotionally disturbed and didn’t have their food for three days along with the child. I have known the family for more than five years. I always admired them for their love, concern and affinity with the homeless animals in their neighbourhood. I have been providing them with pet foods, medicines and water bowls for their pets. Whenever I met them, we had long discussions by sharing valuable information about pet animals and the importance of their child’s education. During my interactions with them, I used to admire their unconditional love and passion towards the homeless animals. When the child was narrating this incident to me, her eyes pooled with tears, even her mother too. The innocent father asked me, “Sir, don’t we have any rights to rearing even a small squirrel?”. “We are homeless”. “We are uneducated and voiceless”. We always feel that these homeless animals are also like us. That’s why we love each other. In this world, as a nomadic tribes, we feel being loved by our pets only with unconditional love and loyalty. We too love them unconditionally with compassion. We believe and treat our pets (dogs) as our god “bairava” who protects us against all evils. While listening to them, their hopeless voices made me more painful. That pains took me to many sleepless nights These sleepless and disturbed nights made me to think more and more about the incident and the factors which are responsible for constructing the mindset ( psyche) of people to perceive that the nomadic tribes are cruel, unsocial and compassionate. As a whole, animal activists don’t take the law in your hand without analyzing the facts and others point of view. Just because of she belongs to Narikurava family doesn’t she have the right to have the pets? Can you give answers for Thilothama family’s questions ?. Don’t make others a victim and animals to suffer in the name of animal rescue for your face book posts.